HDCVI technology supports up to 4K ultra high definition resolution. With 4 times the pixels of 1080P, it presents a true-to-life image with impressive clarity that captures even the tiniest of details. As the very first technology to bring 4K-over-coax to the market, HDCVI comes with a complete product portfolio. The 4K box camera (DH-HAC-HF3805G) features Starlight capability and offers a full color image even in extreme low-light environments. The 4K IR bullet and dome cameras (DH-HAC-HFW3802E-Z & DH-HAC-HDBW3802E-Z) feature 120dB true WDR and long-distance IR range. The 4K multi-sensor camera(DH-HAC-PFW3601-A180) and fisheye camera (DH-HAC-EBW3802) capture a panoramic image which covers a wider monitoring area. HDCVI technology can simultaneously transmit 4 signals (audio, video, data, and power) over 1 coaxial cable. 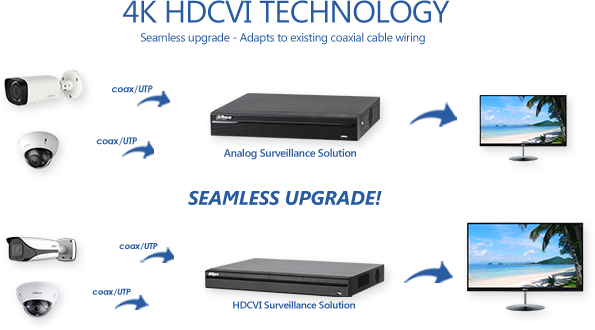 HDCVI cameras offer high resolution video, support audio input or built-in mic, and communicate with the HCVR through control signals. Moreover, Power-over-Coax (PoC) technology has been made available for integrated power-supply requirements. HDCVI cameras are able to cover multiple signal acquisitiondemands, further simplifying the installation and deployment of surveillance systems. HDCVI technology guarantees long-distance transmission in real-time without any signal loss. Based on real-world scenario testing in Dahua's test laboratory, it supports the following distances at the corresponding resolutions. Whether in constructing a new system or upgrading an existing obsolete system, the deployment of an HDCVI solution requires only minimal basic labor and costs. Users are able to enjoy the advantages of modern technological innovation with their existing analog infrastructure. Even if the current system is using other HD-over-coax technologies, HDCVI is perfectly compatible and can be easily integrated, owing to its full compatibility with HDCVI/AHD/TVI/CVBS/IP. HDCVI devices are always plug and play, making construction flexible, and enabling no-hassle network configuration. In addition, HDCVI systems allow the reuse of existing cables as it is compatible with both coaxial cable and UTP. CameraImage Sensor1/2.8" CMOSEffective Pixels1937(H)×1097(V), 2.1MPScanning SystemProgressiveElectro..